Devon: Abbots Bickington, Ashwater (2), Black Torrington (2), East Bridgerule, Bradford, Clawton, Cookbury, Holsworthy (3), Halwell, Hollacombe, Luffincot, Milton Damerel (2), Northcote, Pancrasweek, Pyworthy (2), St Giles-in-the-Heath, Sutcombe, Tetcot, Thornbury, Virginstow, Broadwood Widger (2). Cornwall: West Bridgerule, North Tamerton. The building had a somewhat unusual T-shaped plan. At the front, the Guardians' board-room lay to the right of the entrance, with girls' day room and scullery behind. To the left of the entrance were dining hall with kitchen and boys' day room to the rear. Women's and men's accommodation was in the rear wing. Holsworthy workhouse and infirmary blocks from the east, 2001. To its rear was the main accommodation block at the centre of which was located the master's quarters, with accommodation for males to one side, and females at the other. In 1871, the Guardians were authorized to spend £3,090 on the building of detached infectious wards. A 12-bed infirmary block was erected to the west of the workhouse in 1904 at a cost of about £1700. Holsworthy from the north-east, 2001. 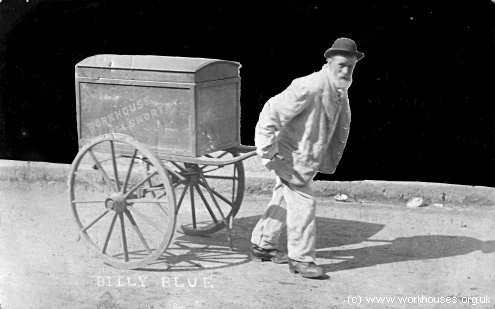 Billy Blue (a workhouse 'character'?) c.1905. The former workhouse buildings have now been converted to residential accommodation. North Devon Record Office, Tuly Street, Barnstaple, EX31 1EL. Very few local records survive — holdings include: Guardians' minute books (1836-9, 1926-32); Assessment committee minutes (1896-32); etc.